An application to amend the County’s official plan and rezone soup harbour waterfront to allow for an additional 337 camper units at Quinte’s Isle Campark stirred a passionate discussion in Cherry Valley Thursday. 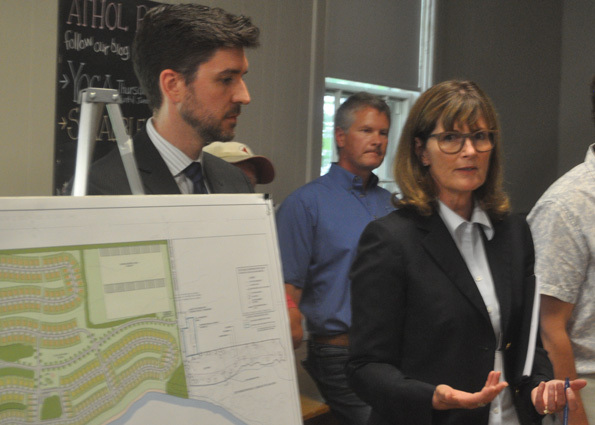 The park’s owners, Tim and Steve Ward of Fourwards Holdings Inc.,had their engineers, land-use planner, and consultants present for an open house session at the Athol Town Hall but it quickly became clear the about 40 people in present were collectively looking for a more formal response to their concerns about the development. After several moments of confusion about the format, Wellington native Jane Macdonald climbed up on a table, hollered for attention, and asked if the proponents might address the audience in a different manner. While the Wards’ legal representative Patrick Harrington initially insisted the forum provided for people asking individual questions, the family and its team agreed they could work in a group session. The first query raised was about how the project is in the public interest. Ruth Ferguson Aulthouse, the Wards’ land-use planning consultant indicated a planning report was submitted to council on behalf of Quinte’s Isle in March. The report spoke to the official plan policies that applied to the application to convert the land from a rural designation to a shoreland designation. At present, the municipality has not taken any action with regard to the report. Ferguson Aulthouse, who was involved in writing the County’s official plan in 1990-1992 said there’s a focus on promoting tourism opportunities, particularly in designated tourism corridors. The existing 619-site Quinte’s Isle sits on one of those corridors, in close proximity to the Outlet Beach at Sandbanks Provincial Park. Ferguson Aulthouse said it is becoming increasingly difficult for mom and pop operations to fulfill the criteria for servicing those campgrounds, so more often than not, that waterfront is converted to homes and fewer people have access. That leaves experienced operators like the Wards to fill the void, she said. One resident openly questioned when the county will have enough tourism and who will ultimately make that decision. He said the talk about people having an opportunity to be on the water is taking away from the opportunity from people who live in the community to have access to that same water. Residents asked questions about the impact of the change on wildlife along the provincially significant wetland that abuts the proposed expansion, about traffic increases and services for a self-contained village they said could accommodate as many people as Wellington, and the studies provided. Lynne Rochon said she felt the community really had to address its concerns with the municipality too. “We could go on arguing or debating this forever. From my perspective, I’m annoyed I found out about this only a short while ago. To me, our argument should be with town council. There should be a public meeting with all of the council,” she said. Harrington said once the Wards file a complete application, the County’s staff will produce an overview report and recommendations for council to review. The timeline for that, he said, is unclear due to an election year. A traffic study based on modelling on a Friday evening in August suggests 150 cars travel through the Quinte’s Isle gates off Salmon Point Road during a peak hour. The modelling estimates that will increase to 225 if the expansion is approved and assumes an 80 per cent occupancy rate at that time of year. Some residents felt the traffic volumes are already too heavy on the road and pose dangerous conditions for pedestrians and cyclists. Residents requested a broader scope be considered in the interest of safety. There was also some talk about an alternate entrance for the development. At present, there is an alternate emergency entrance down Welbanks Road, but some felt more consideration was necessary. Another subject that drew considerable interest was plans for the wetlands reserve to the south of the project. Upon consultation with Quinte Conservation, there are plans to develop a modest parking area off the end of Welbanks Road with the possibility for an observation tower. There may also be public waterfront access, which is something developers say the conservation authority was keen on having included. Proposals for that area still must be vetted by the municipality and Harrington suggested the municipality could place a hold on development lands until it was satisfied with the wetland allowance. Nina-Marie Lister brought the conversation back to economic impact. She said tax revenue to the County would be about $300,000 a year, which is less than half a percent of the operating budget. She questioned how that might compare to the money generated by passive recreation on rural lands, such as birdwatching. Ferguson Aulthouse said the proponents’ valuations will be reviewed by the County’s peer reviewer. Tim Ward said he feels the benefit will be more than tax revenue. The expansion would provide for the employment of six people and it would also bring in $800,000 in development fees, which he says will contribute toward servicing the new units. Lister also asked if the proponents would consider the County’s new draft official plan, which would move the tourism corridor away from the wetland area and wondered if they’d consider setting the bar higher. Ferguson Aulthouse said they’d consult with County staff about how to navigate that consideration. Asked if there were any other considerations for the land, Tim Ward said camping units was the priority, stressing that his family has a long history of offering the amenities. “We run a campground business. It’s what we do,” he said, adding the family bought the park 35 years ago when it had 30-40 sites and was “really not a good place.” With a lot of work, they built a business they could be proud of that’s rated in the top two per cent of parks in North America, equivalent to Disney’s First Wilderness Park. Harrington closed on a positive note.